As a geeky teen, I met the 1950s pitcher. My Uncle Mel Adams lived in Grinnell, Iowa. He knew Collum from the golf course. Uncle Mel arranged a meeting. Being a regular customer at Collum’s Pioneer Gas Station helped. Collum shared great tales, including roommate Sandy Koufax wanting to sleep in during Yom Kippur. 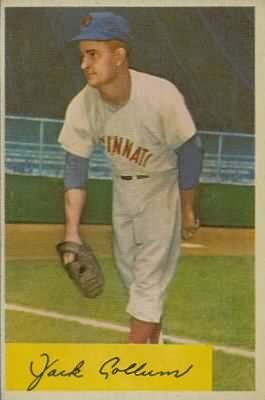 I asked what then-current pitcher might resemble him most from his heyday? Collum chose Randy Jones. Collum had told my uncle that he’d autograph whatever I brought. I had a baseball and Collum’s 1955 Bowman. I marveled at his looping, precise penmanship. Collum’s dark eyebrows lowered. He glared like I was crowding the plate against him. He flashed a slightly-curled upper lip. Impish glee, or a slight sneer? Years later, my wife and I came back to his station as children’s authors. He spent an hour with us, sharing his life story. As children’s book authors, we were going to teach for a week at the middle school. Students gasped at the thought of a real major leaguer returning to live in their town. They loved his career highlights and his devotion to Grinnell. Trouble is, they had never heard of Jackie Collum. All hands shot up. The only student who disagreed was someone named Nathan Collum — Jackie’s grandson. Collum did die in 2009. He reminds me that a non-signer through the mail can be a pal in person (or vice versa). And his spirit would be grinning today, knowing that his autograph as a deceased player has long surpassed the 85-cent mark! For a great look back at Collum’s career, enjoy this fine feature by William Sherman.